Switching from iPod to radio or radio to iPod will be as easy as removing the AUX cable! To modify your radio as shown in this picture, please fill out and print the Repair Request Form and sent it with your unit. Please be sure to note the style number! This model's internal AUX modification will be $60 + $15 Shipping and Handling in the US. If you prefer, we can modify this model to have an External AUX Jack to be mounted to any part of your console (Style No. LE008B). 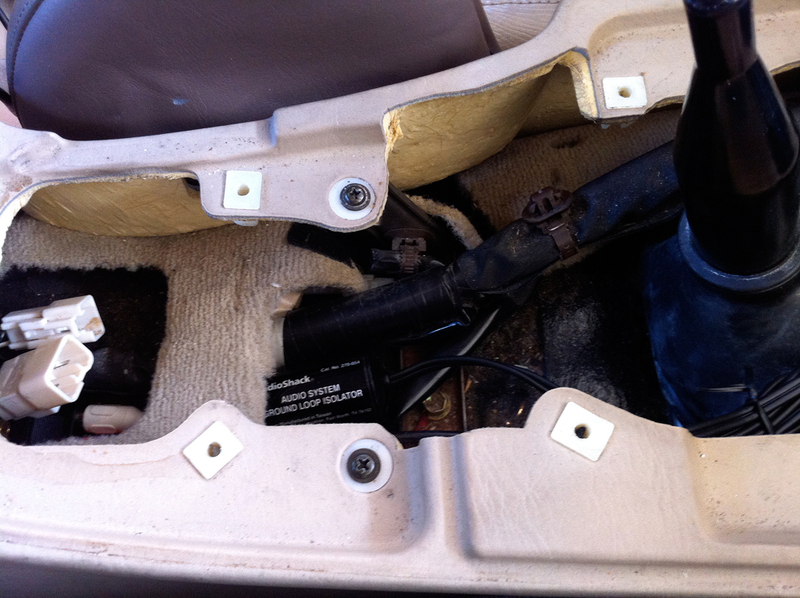 This modification will not change your radio's faceplate, but you will need to mount the AUX jack. This model's external AUX modification will be $60 + $15 Shipping and Handling in the US. Someone send me a Nak unit and i'll try to figure out...lol. Has anyone tried this on a 98 ES300 pioneer? I have a 91 with the tape deck (its a Japanese import if that helps identify it), how to I tell what model it is to know if it has the three prong plug before pulling everything out? Desperately want an aux in but haven't been able to find anything about using the cd changer line etc so this seems like a good route. Honestly, i couldn't tell you. If you were to take some time out from your day and just check it, and report back here if it's doable, that'd be appreciated. It'd be nice to keep tabs on all the factory radios that this works for. I will take some external pictures and pull the unit out and report back though it may be a few days. Well, yes, you don't need to use the exact components i listed. But the reason for servo cable is that it's a direct plug in. And then that AUX jack from radioshack has 3 easily solderable points and a threaded body, so it's very easy to mount on the rear of the radio housing. Sorry, I forgot about this until I checked my old e-mail account and saw the replies. Anyways here is a picture of the headunit. Car is a Japanese import Toyota Soarer GT-L. Can you identify what headunit this is and if it has that 3 prong connection to wire in an Aux connection? If not I have two interior pieces to replace in the next day or two and can see about pulling the unit out to get a look at the back at the same time. Thanks. I just did this modification today and it worked out perfectly! My tape deck is broken so I have to use my CD player function to get a dead channel to play through but it operates just the same way. Radio Shack has these for $16. You can get any ground loop isolator you want. They all perform the same function. And make sure you have whatever adapter accessories you need to go back to a standard 1/8" connection. Some other GLI models are 1/8" on both ends. The Radio Shack model is dual RCA. The gold double-ended connector shown here was actually the wrong size-- bought it by accident. I found a spare one in my toolbox. And here it is installed in the console. I stuffed it just under where the cupholder goes. 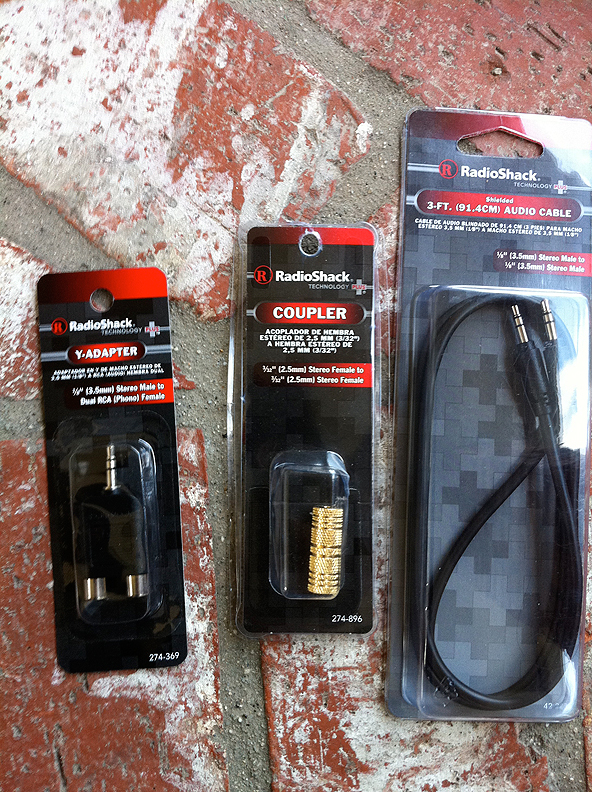 Now your audio should sound perfect and crystal clear regardless of whether you are charging your iPod/iPhone/whatever. 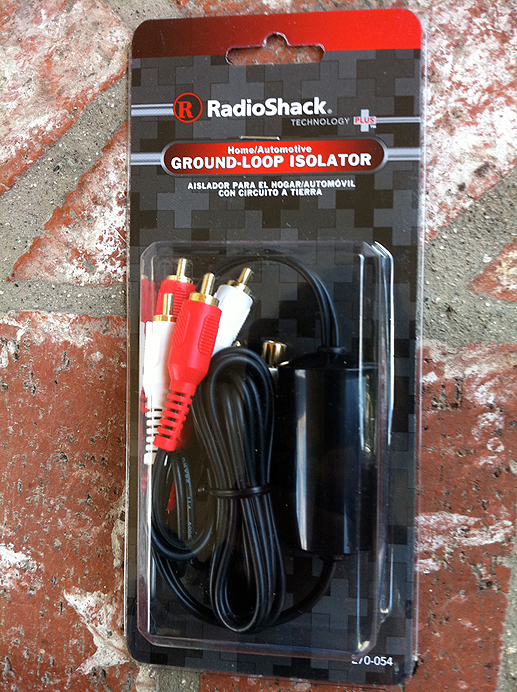 I also found this other ground loop isolator model that offers stereo sound and charging out to a standard iPod/iPhone dock connector. I am trying to find out if the pinouts work for iPhones. Last edited by KahnBB6; 10-06-11 at 04:37 PM. Today I bought everything to hook everything up... but I can't find those connectors? I saw that someone had the same problem, but how it was solved, can anyone help?